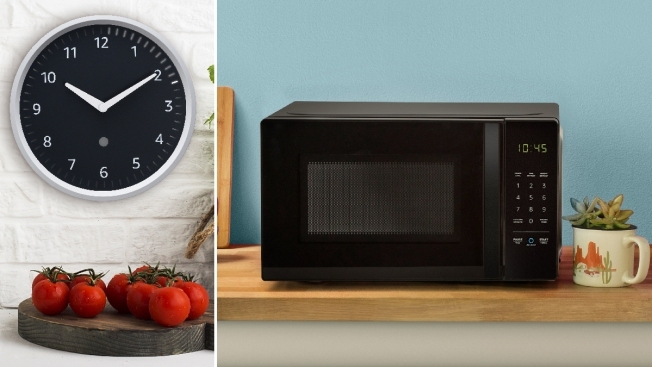 Two Amazon smart devices announced Thursday, Sept. 20, 2018: the Amazon Echo Wall Clock and the AmazonBasics Microwave. Amazon announced 15 new Alexa-enabled products in less than 90 minutes at an event in Seattle on Thursday, further cementing the company's commitment to the voice assistant space. The new suite of items range from microwaves, clocks, security devices and car gadgets, as well as upgrades to its iconic speaker Echo. It also introduced new ways to add Alexa to third-party devices. The company announced a new Echo Dot, its most popular Echo speaker. The Echo Dot is the best selling speaker of all-time, according to Amazon senior vice president of devices and services David Lim. The new Echo Dot, which will cost $49.99, will be 70 percent louder and have clearer sound. It will have an industrial design and the fabric face will come in multiple colors. Orders for the new Echo Dot start on Thursday, and it will ship next month to every country Alexa is available. Amazon also announced a new Echo Plus, which has cleaner sound and better bass. It too will have a fabric design, as well as an internal temperature sensor. This new model will build on last year's smart home hub and will add lock controls so home commands will still work even if the Wi-Fi is unavailable. It will cost $149, with orders starting Thursday. It will ship later this month. Echo Show will also get an upgrade, with a 10-inch HD display, fabric body and improved sound was introduced. It will have dual side-firing speakers and an eight microphone array. Bonus features include integration with Vevo for music videos and Hulu Live TV, as well as Microsoft Skype for video calling. Amazon Silk and Firefox browsers will also be included. It will sell for $229, with pre-orders starting Thursday. It will start shipping next month. Other new devices include an Amazon Basic Microwave, which is deeply integrated with Alexa. It works in conjunction with a nearby Echo, but it failed to listen to commands initially during a test on Thursday. However, it eventually successfully started microwaving a potato based on voice commands. The microwave will cost $59.99, and ship later this year. CNBC previously reported Amazon was working on a smart microwave, among other products. "The user interface for a microwave is still stuck in the 70s," Lim explained. Amazon also announced a device for the car called Echo Auto. Echo Auto will come with a dash mount, and is built on a new operating system from Amazon. It boots quickly so it is ready after the car is turned on. It connects to vehicles through Bluetooth, Bluetooth LE or an auxiliary jack. Data connections via a mobile phone can be used for Alexa integration. Echo Auto will be able to understand location-based routines, like pulling up to a home can alert Alexa to turn on your lights. It can ask where the nearest Starbucks is, can read you an audible book, call a user's home and call other Echos. And yes, it can provide navigation linked through Waze, Apple Maps and Google Maps. The device is $49 but will be $25 for special invitees and will ship later this year. Amazon also introduced a $25 Alexa smart plug. The device will allow users to plug items directly into it and it will automatically sync with an existing Echo. A demo of the product allowed Lim to set up a smart lamp in 20 seconds using only voice commands. The company also announced an Echo Wall Clock, which can be used to set timers and other time-based Alexa tasks. It will cost $30 and ship later this year. "You never have to worry about daylight savings," Lim said. "The motor will automatically change." Amazon also moved further into the security space. Alexa Guard will take your Echo, smart lights, and security service provider, if you have one, and sync them all together. Users could say, "Alexa, I'm leaving," and the product will move all your Echo-linked devices into guard mode. Other smart alerts include away lighting mode, where smart lights will intelligently randomize lighting to make it look like someone is home. Alexa Guard will be integrated with Ring and home alarm company ATD to begin. The company also announced new Ring stick up security cameras, which come in wired and wireless versions. It will be available for $179.99 later this year. A Fire TV Recast allows users to get over-the-air TV channels, which can be viewed on Echo Show, Echo Spot, Fire TV, iOS, Android and on-the-go outside the home. It will allow up to four shows to be recorded at one time and can stream to multiple devices simultaneously. Price starts at $229. Echo products are expanding to work with other devices. A new Echo Input will give Alexa-capabilities to existing speakers, microphones and Bluetooth devices. Amazon will sell the product with partners, including Bose, for $34.99. The company also announced the Echo Link Amp and Echo Link, which can couple with higher-end speakers. The Echo Link Amp will be available for $199 later this year, and the Echo Link for $299 early next year. An Alexa Connect Kit will allow the smart assistant to be added to other devices made by third-parties. P&G and Hamilton Beach are among the partners. Echo will also soon be able to handle left and right inputs for stereo sound. To improve the listening experience, Amazon announced an Echo Sub to add additional bass. It will ship this month for $129.99. Pre-orders begin Thursday. Thursday's announcements also included new abilities for Alexa. It will soon be able to understand when a person is whispering, and will reply in a whisper. The company will also add more podcasts for kids as part of Kids FreeTime for Alexa, as well as more than 1000 Audible audiobooks for children. A new skill called Alexa Hunches allows Alexa to intuitively put routine things a user asks for together. For example, if you tell Alexa "good night," and the command usually turns off the lights, Alexa will also check other "good night"-related features, including seeing if your doors are unlocked. It will then make other recommendations based on its "hunches." In addition, Amazon is making it easier to set up devices by allowing users to save all network configurations online through a feature called Wi-Fi simple setup. A new device will boot up, previously recorded settings, and set itself up. The ability to integrate with third-party devices will be added soon. Note: The parent company of this station and CNBC, NBCUniversal, is an investor in Hulu.